Art Basel and BMW are delighted to present Astha Butail (represented by GALLERYSKE, New Delhi, Bangalore) as the next BMW Art Journey winner. The international jury selected her unanimously from a shortlist of three artists whose works were exhibited in the Discoveries sector at this year’s Art Basel show in Hong Kong. Her winning project titled “In the Absence of Writing”, is concerned with memory and living traditions that are passed down through teaching and oral poetry. It, in the artist’s words, will be “a homage to the intangible oral traditions that are still alive today.” Butail’s research on systems of cultures started in 2009, when she began learning Sanskrit and memorized a collection of hymns. 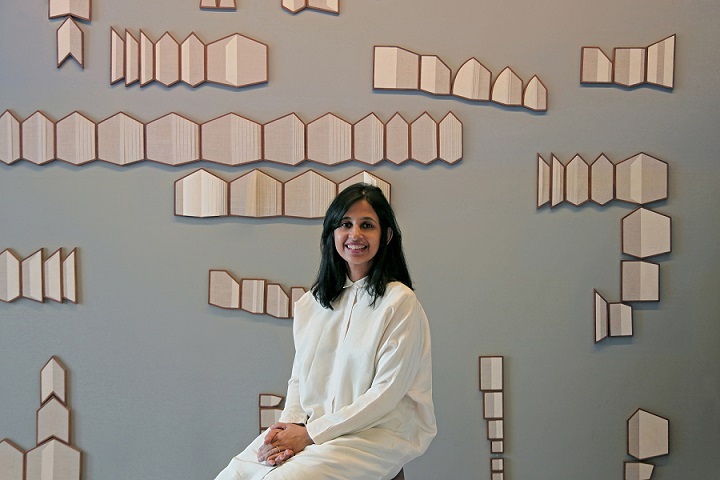 For the BMW Art Journey, Butail plans to investigate the Zoroastrian Avesta, Jewish Oral Torah and Indian Veda traditions by observing and recording their different memory techniques and interviewing scholars and practitioners of each tradition. The journey will lead through the cities of Yazd (Iran), Jerusalem (Israel), London (United Kingdom), Varanasi, Pune, New Delhi and Mumbai (India). Art Basel and BMW will collaborate with the artist to document the journey and share it with a broader public through print publications, online and social media. The international experts awarding Butail’s proposal were Claire Hsu, Director, Asia Art Archive, Hong Kong; Bose Krishnamachari, President, Kochi-Muziris Biennale, India; Matthias Mühling, Director, Städtische Galerie im Lenbachhaus and Kunstbau, Munich; Alexandra Munroe, Senior Curator of Asian Art, and Senior Advisor, Global Arts, Solomon R. Guggenheim Museum, New York; and Pauline J. Yao, Curator Visual Art, M+, Hong Kong. In addition to Ashta Butail, the shortlisted artists from the Discoveries sector for emerging artists at the 2017 Art Basel show in Hong Kong were Julian Charrière represented by Dittrich & Schlechtriem, Berlin and Lin Ke represented by BANK, Shanghai. Launched in 2015, the BMW Art Journey is a collaboration between Art Basel and BMW, created to recognize and support emerging artists worldwide. The award is open to artists who are exhibiting in the Discoveries and Positions sectors in the Hong Kong and Miami Beach shows of Art Basel, respectively. Two judging panels comprised of internationally renowned experts meet first to select a shortlist of three artists from the sector, who are then invited to submit proposals for a journey aimed to further develop their ideas and artistic work. The jury reconvenes to choose a winner from the three proposals. Past winners of the BMW Art Journey include sound and performance artist Samson Young presented by a.m. Space, Hong Kong at Art Basel’s Hong Kong show in 2015, who is representing Hong Kong at the 2017 Venice Biennale; German video artists Henning Fehr and Philipp Rühr presented by Galerie Max Mayer, Dusseldorf at Art Basel’s Miami Beach show in 2015; British artist Abigail Reynolds presented by Rokeby, London at Art Basel’s show in Hong Kong in 2016 as well as Max Hooper Schneider who was recently announced as the fourth winner and is presented by High Art, Paris at Art Basel’s Miami Beach show in 2016. The next round of selections for the BMW Art Journey will take place during the 2017 edition of Art Basel in Miami Beach, where on December 7, 2017 the three shortlisted artists from the Positions sector will be announced. The next winner of the BMW Art Journey will be presented in spring 2018. BMW is a global partner of Art Basel and has supported Art Basel’s three shows in Basel, Miami Beach and Hong Kong for many years. Astha Butail, born in 1977 in Amritsar, India, lives and works in Gurgaon, India. Central to her artistic practice is the use of geometry as a means of inquiry to understand how different composite elements of an entity relate to its whole. Her themes are memory and time, the idea of the archive, and collaborative authorship. At Art Basel in Hong Kong 2017 Butail presented her work “Turning towards pure white” (2017) including an assemblage of wall and floor based elements as well as framed panels, three-dimensional pieces extruded from the picture plane, and a participatory book. Butail’s debut solo exhibition was shown at GALLERYSKE, Bangalore. Recent group exhibitions include Experimenter, Kolkata, Devi Art Foundation, Gurgaon, and Masquelibros Artists’ Book Fair, Madrid. Founded in 1970 by gallerists from Basel, Art Basel today stages the world’s premier art shows for Modern and contemporary art, sited in Basel, Miami Beach, and Hong Kong. Defined by its host city and region, each show is unique, which is reflected in its participating galleries, artworks presented, and the content of parallel programming produced in collaboration with local institutions for each edition. Art Basel’s engagement has expanded beyond art fairs through a number of new initiatives. In 2014, Art Basel launched its Crowdfunding Initiative, in collaboration with Kickstarter. This initiative presents jury-selected art projects to potential benefactors, which include Art Basel’s vibrant audience and the Kickstarter community. The initiative has catalyzed much-needed support for outstanding non-commercial art projects worldwide and so far has helped pledge over $1.5 million to creative projects around the world. For Art Basel Cities, launched in 2016, Art Basel is working with selected partner cities to develop vibrant and content-driven programs specific to the individual city. Connecting them to the global art world through Art Basel’s expertise and network, Art Basel Cities supports its partners to develop their unique cultural landscape. For further information please visit artbasel.com. For almost 50 years now, the BMW Group has initiated and engaged in over 100 cultural cooperations worldwide. The company places the main focus of its long-term commitment on contemporary and modern art, classical music and jazz as well as architecture and design. In 1972, three large-scale paintings were created by the artist Gerhard Richter specifically for the foyer of the BMW Group’s Munich headquarters. Since then, artists such as Andy Warhol, Jeff Koons, Daniel Barenboim, Jonas Kaufmann and architect Zaha Hadid have co-operated with BMW. In 2016 and 2017, female artist Cao Fei from China and American John Baldessari created the next two vehicles for the BMW Art Car Collection. Besides co-initiatives, such as BMW Tate Live, the BMW Art Journey and the “Opera for All” concerts in Berlin, Munich and London, the company also partners with leading museums and art fairs as well as orchestras and opera houses around the world. The BMW Group takes absolute creative freedom in all its cultural activities – as this initiative is as essential for producing groundbreaking artistic work as it is for major innovations in a successful business.